Exactly how high up are those geostationary satellites, and how do they get there? Here are very brief answers to these questions. 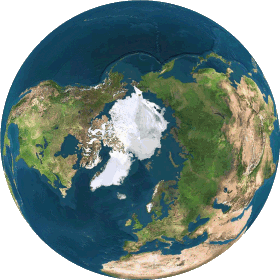 This animation shows the Earth, viewed from above the North Pole, with a satellite starting at perigee and orbiting in an elliptical orbit until the Go to GEO button is clicked. The satellite then increases speed at its next apogee, into a circular orbit. The animation shows the scale of the orbit, so that the Earth and the path of the satellite are roughly in the correct proportions. The satellite itself is made much too large so it is easily visible.